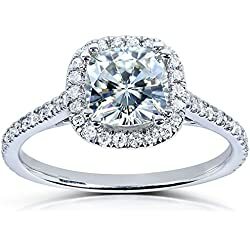 My favorite unique diamond engagement ring ideas! Which engagement ring do YOU want? Are you going to buy it from a jeweler or are you hoping to have your engagement ring custom made? Do you love the idea of owning an engagement ring that nobody else will wear? Do you like to stand out from the crowd? Do you want to combine elements from many other engagement rings that you have seen? 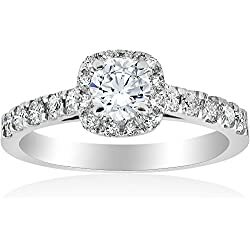 Do you want to wear a ring that will be impossible to date and does not fit into any particular ring trend? Then a unique engagement ring is probably going to be perfect for you. 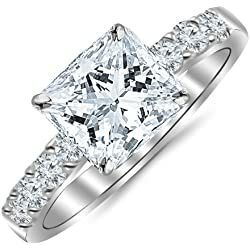 Let’s take a look at some of my favorite UNIQUE diamond engagement ring ideas… I’ve got a LOT of ring pictures below. Feel free to pin any ring picture to Pinterest to save for later. A unique ring is by definition, a one-off, although many couples would probably concede that it is literally something a little different out of the box, that they are unlikely to see on anyone else’s finger. 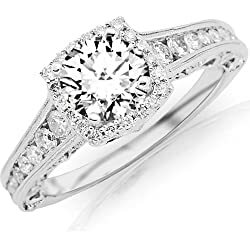 Unique engagement rings are perfect for those couples who do not want a ring that is seen to be the same as another. Let’s be honest – who WANTS to see her own unique engagement ring on another woman’s hand? 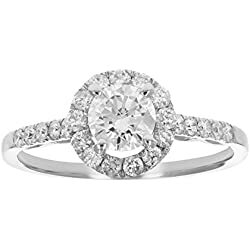 One way to obtain a relatively unique ring or even unique wedding rings would be to consider an antique engagement ring. These rings have been made more than 50 years ago, so the chances of running into the ring’s twin are relatively remote. 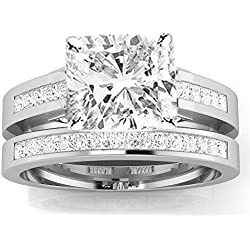 However, this solution is only going to work for those couples who are happy with pre-loved rings that are older or classic looking. Those couples who are looking for a more contemporary feel are going to be better off having a ring custom made. Custom made unique engagement rings. This is the only real way to ensure that you will never see your engagement rings on another finger. Custom jewelers are the ideal choice for a one off engagement ring as they will be able to guide you every step of the way. Perhaps you have seen several engagement ring styles that you love that you want to combine. Perhaps you have the rings pictured in your head, ready to be drawn up. Perhaps you have a whole lot of ideas, or are looking for inspiration. LOVE this mug! Makes a Great Gift!see the mug hereWhether you have a fixed idea or none at all, a custom jeweler should be able to assist. Those with no ideas should give some thought to their engagement ring budget before consulting the jeweler. Other considerations could be lifestyle, what sort of metals you wear or like, and any other jewelery or fashion styles that you love. Have a look through some bridal magazines, or search the Internet, until something jumps out at you. If you are wanting elaborate work, or extremely fine settings, then you may want to consider utilizing a custom jeweler who has access to the latest computerized jewelry design and manufacturing equipment. These allow for a much more accurate level of jewelry design from the initial sketch diagrams to the finished final piece. 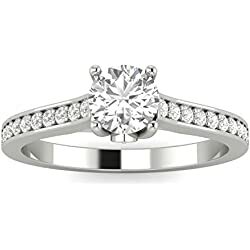 Unique engagement rings are ideal for the couple who want their engagement ring to stand out from the crowd, or possibly have a sentimental and special meaning for them. Antique engagement rings can be one alternative for those seeking an unusual ring. Alternatively, for a truly one-off ring a custom jeweler will be able to create a unique engagement ring. Have you see all my wedding hairstyle idea pictures?.